I turn to my spirit guides and seek connection. Tomas steps aside, so does Medea. The curtain of spirit friends steps back to reveal one I am not so consciously aware of. She seems soft, almost demure at first, but as I step closer, I see fire in her hooded eyes. A ‘she-cat’ with claws, her spirit animal is a wildcat, a were cat, a lynx. I see both of her forms, human and cat, head off in different directions. I decide to follow the cat first. We run, run and leap. Now we are on a stone wall, looking around while pretending we are just washing our claws. Seeming to pay no attention at all when in fact, we are drinking in every over-turned stone, every bent blade of grass, every shift and scent in the air. My whiskers are quivering and I’m feeling strongly drawn to some smell in the west. We jump down, bounding, stalking, sleeking…. oh it is bliss to move like this! I have found a black, smelly river in the earth. Not really a river: more like a crack, a seam. I step on it’s surface with my paw and it is hard like unbroken glass. I can see my own reflection and suddenly I am turning, twisting in the air, arching my back and extending my claws and teeth because I can see a shape looming over and above me. In mid turn, I realise it is him and go limp as he catches me in his large hands. My dohmey-re… king-father, magician, liberator, teacher. I claw my way up his thick coated arms and climb onto his back, watching as he extends one finger, meowing a little in fright and awe as I see the finger penetrate the hard black surface, as though it were nothing but oil. A river that looks like water but shuts itself up like glass for me, becomes true water at his touch. I am myself again, all dressed in finery and soft flowing cloth, strange tattoos snaking their way up my arms. I am riding my steed and my steed is my dohmey-re in disguise. I would recognise that distinctive smell anywhere. But we ride backwards, as though moving backwards in time. And we pull the crystal energy with us from the centre of the citadel…. beautiful streamers of light flowing from the crystal to my bejewelled arms, which I hold high above me. Now all are stopping to watch, and they are joining us, walking backwards in time, many hearts and minds joining us in light. We climb backwards together out through the crack in the earth and these beautiful lives, these beautiful volunteers…. they form their bodies like glue into the crack, like bridges of light darning a hole in the sole/soul of the Earth herself. We are weeping and rejoicing, for the darkness can be no more and yet the darkness had it’s own gift to give: a new time of connection, awakening and wholeness. We are One. I thank the dohmey-re, and walk back to the dividing path, now hurrying after the spirit lady who went in the other direction. I catch her and she turns as she feels my hand on her shoulder. Her face. She is me but not me. Her name is Calliope. A lady of the stars, a resin of the earth, a white lilly that fills the air with heavy scent. We travel now together, one leap-frogging over the other and I know not where we go but she is fine, and I am fine if she is me. We dance and laugh…. and then, there are her claws and sharp teeth again. “What do these represent?”, I ask her. “Do I do you a disservice, that you must carry it for me because I will or cannot?”, I ask. I am strangely reminded of the boots that came for me in the mail today. Italian vegan boots, so beautiful! Her load becomes the vegan boots; sleek, glamorous, chunky but light, tough and free, earthy and bold, practical and inviting. I pull them on with delicious anticipation, enjoying every tiny millimetre as they slide into, over and throughout my being. I am gloved and booted. I am toughened and free. I have claws with kindness and teeth to bare when I smile. I can roar and laugh, I am fire and pain, burning with liberated flame. I sink my teeth into her and we become one. We are devoured by the light of our love for another. I love her and she loves me. Must be more to this though- i get the nagging feeling about stars. I’m going to search Calliope (or with a K?) and stars…..No. Can’t find anything. I will ask her. I like that! Ok, so the other reference, I was curious about, was the wildcat… or Lynx, more specifically. I noticed that it was said Calliope was lover to Ares the war God… so perhaps some fire in her was attracted to him, or he rubbed off on her, because she certainly wasn’t all peaches and cream! She knows the power of silence (I am perfecting the fine art of biting my tongue! ), the power of words, and uses words like a magical potion. The Lynx person can watch someone walk straight towards an open manhole and sensing that to try to warn the other person would be fruitless, they must sit back and allow the other to carry on as they will, even if that means the person ends up going straight into the hole! I spoke with a client today who said that she has just emerged from an experience she was immersed in and has been recalling very accurate things I said to her at the time that she simply couldn’t absorb because the experience had such a strong hold on her. People hear when they are ready. 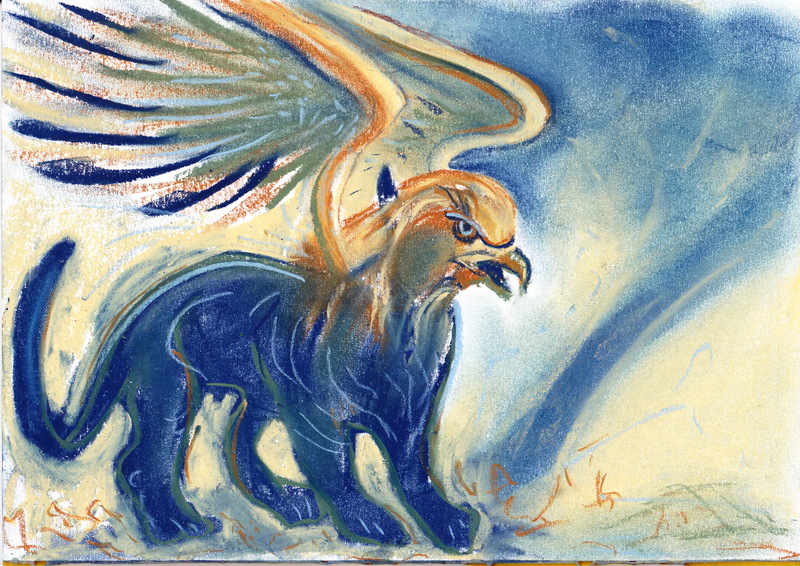 I recently spoke with a Hippogriff, a few days after purchasing a book about mythical creatures. My husband noticed the book and asked, “So does it have a griffin in it?”, without knowing anything about my hippogriff experience. I explained the difference between a griffin and a hippogriff.